The four big-hitters among the country’s sports broadcasters have all pledged to keep diversity on top of their recruitment agenda. Simon Green, the head of BT Sport, Philip Bernie, the head of BBC Sport, Sky Sport News executive Andy Cairns and Stephen Lyle, Channel 4’s commissioning editor for sport, were the guests at the #DWORD2 conference on diversity. The event, staged at BT Sport’s studio in Stratford, tackled the issues of gender, race, disability and LGBT bias in the industry. And the admission from a string of high-profile panellists was an overwhelming “should be doing a lot better”. Other guests included Lewis Wiltshire, senior director at Twitter, Squawka’s chief content officer Amar Singh, Times sports editor Alex Kay-Jelski and Rodney Hinds, sports editor of The Voice. Andy Stevenson, Channel 4 commissioning executive, and Shelley Alexander, editorial lead on women’s sport for the BBC, were also involved in either a panel or a workshop as was Sonali Shah, BBC broadcaster, retired rugby player Maggie Alphonsi and Telegraph sports writer Jonathan Liew. Subjects included the “Rooney rule” and quotas (opinion divided), the benefits of finding a mentor, and if employers were looking in the right place when they wanted staff. Both BBC and Sky pointed to a steady increase in the employment of women, BT Sport revealed they had initiated a major recruitment drive in the challenging boroughs adjoining Olympic Park and Channel 4 reported that their coverage of successive Paralympic Games had resulted in 20 disabled broadcast professionals, most of whom were in Rio. However all four broadcasters conceded that there was a lack of diversity in high management positions. The statistics presented by the conference organisers, BCOMS (Black Collective of Media in Sport), made depressing reading if you were anyone other than male and white. They took a snapshot of four of this summer’s major sporting events – the Olympics, Paralympics, football’s European championships and Wimbledon – and looked at the coverage provided by eight national newspaper titles and the four broadcasters. There were 456 roles in total. Women filled 92 jobs but, of those, only six were from a BAME background. There were no BAME women among the 143 newspaper positions for the four events. There was only one woman (non-BAME) out of 53 newspaper reporters at the Euros. Just 19 of 113 commentary roles were filled by women over the four events. The conference was part of the FARE (European football’s anti-discrimination and equality network) Action Weeks that unite supporters, clubs, ethnic minorities and communities affected by discrimination across the continent. The Sports Journalists’ Association, who organised our own diversity forum earlier this year, supported and attended the event. 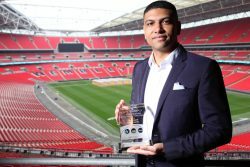 Mann said: “To see hundreds of delegates come together – including many of the most powerful decision makers in the business – to discuss, debate and come up with solutions to address a lack of diversity in the sports media is another significant step forward in this area.